The distracted boyfriend meme -- one of 2017's best memes -- is the meme that refuses to die. If George Romero made a movie about a meme, it'd be this monster that keeps returning from the dead. On Monday, Ernie Smith shared a shocking discovery about the girlfriend in the original meme. It's a shocking discovery because the woman is shocked by pretty much everything. Smith dug up other stock photos starring the woman, and she has a lot of them where she's staring at screens in utter disbelief. Maybe she traveled in time and had her photo taken while she's looking at Smith's thread about her shocked face and it made her make a shocked face before she traveled back in time and then... yeah... memes. Whatever it is that she's looked at, she is very, very easily shocked. The obvious question here is this: Can it be incepted? 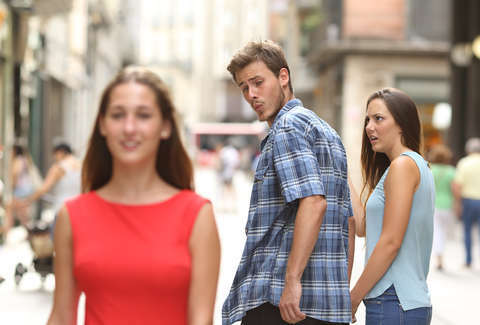 Can the shocked girlfriend be reinserted into the distracted boyfriend meme? If you're asking that question, you already know the answer. Yes. Yes, it can. Seeing all these reactions makes her reaction in the original meme seem kind of tepid. What is on those screens?